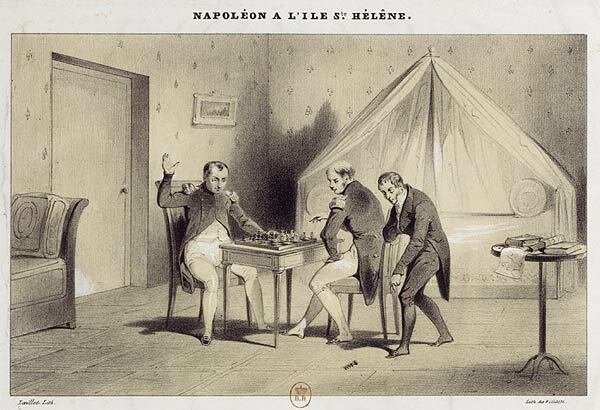 The picture depicts Napoleon (with arm raised) playing chess, possibly with Comte Henri Gratien Bertrand, on the island of St. Helena in the South Atlantic where Napoleon was exiled after his defeat at Waterloo in 1815 until his death in 1821. The Paraguayan stamp incorrectly asserts (bottom left corner) that the artist is ‘Laillot’, as do the catalogues produced by Stanley Gibbons, Domfil, Themechecs etc. In fact, the correct artist is not Laillot, but rather Loeillot (1792-1864?). The work was printed by the lithographer Villain. The title, ‘The king falls to the ground’, does not refer to the decline of Napoleon. Rather, it refers allegorically to King Louis XVIII who was reinstated to the French throne in 1815 by the allies after the Battle of Waterloo. Napoleon is considering what his conduct would be if King Louis XVIII fell into his hands. Whilst playing chess, Napoleon's king falls to the ground (the piece is shown on the floor in the picture, and the attendant is bending over to pick it up). Many thanks to Séverine Lepape of the BNF for his expert assistance in tracing the correct name of the artist.